The Matra Bagheera is a sports car created by Matra in cooperation with the automaker Simca and design by Greek designer Antonis Volanis. Named after the panther from The Jungle Book, the Bagheera was created using stock Simca components, including the engines, gearbox and suspension elements, but unlike the Simca cars it shared them with, it was a mid-engined car. When launched in 1973, the Bagheera was only available with the 1.3 L straight-4 engine, belonging to Simca's Type 315 engine family. In 1976, the Bagheera underwent a major restyling, with basically only the rear hatch unchanged (Bagheera type II). Another change took place in 1978, when the dashboard was replaced again, and in 1979 the Bagheera was given conventional door handles in lieu of the previous "hidden" ones (Bagheera type III). Since PSA took control of Simca in the previous year (after the demise of Chrysler Europe), all Simcas were re-badged Talbot and Matra-Simca became Talbot-Matra. 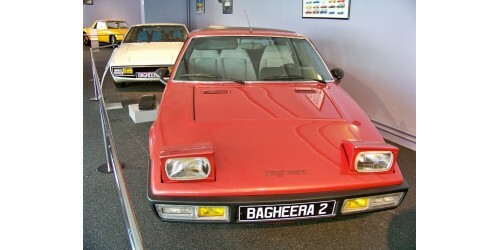 Production of the Bagheera ended in 1980, when it was replaced by Matra Murena, with 47,802 Bagheeras built in total.